A Family Skiing in Maine had a phone conversation with Peter Stein today. Peter is the lead organizer behind the community based effort to reopen Saddleback. Peter indicated there is a narrow but viable path to open the ski area this year. As with any transaction of this type, there are a lot of moving parts and challenges... but Peter is cautiously optimistic he will be skiing down Royal Tiger with his 2 year old grandson this season. One thing is clear. The support shown by skiers and community members via the survey has been a key part of this effort. It has shown there is strong community ready to support Saddleback. If you have not filled out a survey yet it is not too late! Look for the survey link at the bottom of this post. Peter is working towards a near term goal for the organization to start collecting funds to purchase the ski area. When this happens, we all need to carefully consider and react quickly to this fundraising effort to make skiing Saddleback again this winter a reality. I will certainly post more information when I receive it. 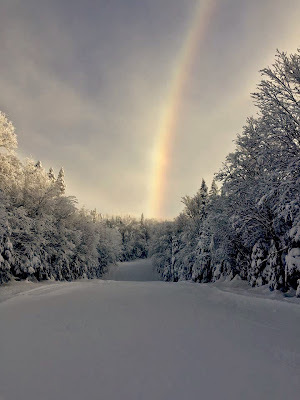 This is an actual photo of a snowmaking rainbow on Blue Devil. Collectively, we can fund that pot of gold at the end of the rainbow and bring back lift serviced skiing to Saddleback! My family are property owners atvSaddleback. Not all of us are on Facebook and just saw the post about the survey and meeting tonight. We would have attended the meeting if we had known about it earlier. What attempts are being made to contact all property owners including those not on Facebook. Please post your email and I will send you my families contact info for further updates. Hi - you can contact me at mike@logicalqa.com and I will forward your contact info to Peter Stein who is the lead organizer for the co-op and also a condo owner. Please fill out the survey and that is another way to give your contact info. Thanks!